Ya he comentado en anteriores instructables que estoy usando mi nuevo taller. Aún me falta hacer el tendido eléctrico y de gas, así como seguir organizando mis herramientas y materiales, lo cual no es fácil. Uno de los problemas con los que me encontré fue la necesidad frecuente de tener que subirme a una silla para alcanzar estantes altos. Usé varias veces unas banquetas barata de PVC, pero luego de algunos sustos desistí, porque tienen las patas demasiado débiles como para confiarles mi peso de 85 Kg. Por lo tanto decidí construirme una banqueta de hierro o madera, reforzada y confiable. Y ya que estaba, darle algún valor agregado de multifuncionalidad. Al principio pensé hacerla plegable, en tres piezas que se metían una dentro de la otra, pero luego de analizar los pro y las contras abandoné la idea y me incliné por algo más simple, y acá les muestro cómo la hice. Si bien yo usé caño de hierro, se puede hacer también de madera u otro material, usando el concepto general y haciendo las correcciones del caso. I've mentioned in previous instructables I'm using my new workshop. I still have to install power lines and gas, and continue to organize my tools and materials, which is not easy. One of the problems I encountered was the frequent need of having to climb on a chair to reach high shelfs. I used several times a cheap PVC bench, but gave up after a few scares, because the legs are too weak to entrust my weight of 85 kg. 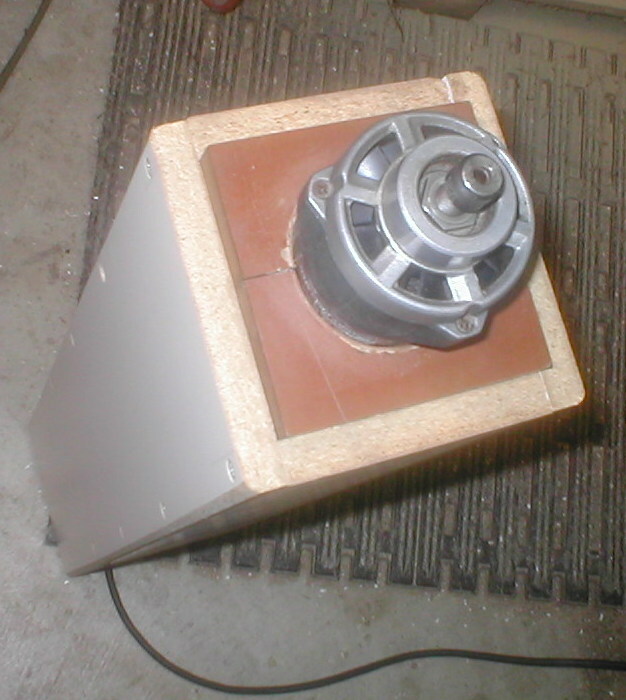 So I decided to build an iron or wooden stool, bolstered and reliable. And as I was, give it some added value of multifunctionality. At first I thought to make it foldable into three parts to put one inside the other, but after analyzing the pros and cons abandoned the idea and I went for something simpler, and here I show how I did it. While I used iron pipe, can also be made of wood or other material, using the general concept and making corrections. La estructura sería de caño de hierro liviano, para que al trasladarla, el peso no representara un esfuerzo adicional. En vista de lo anterior busqué entre los caños que siempre guardo, y hallé algunos metros de caño de 1 pulgada para tendido eléctrico, y otro poco de 7/8. Este último se desliza dentro del otro con bastante exactitud para lo que yo necesitaba. Tuve que comprar otro caño de 1 pulgada por 3 metros, que me costó solamente 23 pesos (unos 5 U$D). The structure would be lightweight iron pipe, so that when moving, the weight does not represent an additional effort. In view of this I searched among the pipes that I always keep, and found a few meters of 1 inch pipe for power lines, and a little 7/8. The latter is slid into the other with enough accuracy to what I needed. I had to buy another pipe of 1 inch by 3 meters, which cost me only $ 23 (about U$D 5). Con mi mesa de corte basada en una amoladora corté tres trozos de 50 cm del caño de 1 pulgada, les aplasté los extremos con la morsa y el martillo, y los soldé en forma de triángulo equilátero. Luego corté otros tres trozos iguales del mismo caño, les hice una ranura longitudinal en un extremo, abrí esta para poderle introducir la esquina del triángulo, y las soldé como se ve en las fotos, a manera de patas. With my cutting table based on a hand grinder, cut three pieces of 50 cm of 1-inch pipe, flattened their ends with visegrip and hammer, and welded them in the form of an equilateral triangle. Then I cut three equal pieces of the same pipe, I made a longitudinal slot at one end of each, opened this so that I can introduce the corner of the triangle, and soldered as shown in the photos, by way of legs. Corté tres trozos de 50 cm del caño de 7/8 de pulgada, les aplasté un extremo con la morsa y el martillo (totalmente innecesario), los introduje casi totalmente dentro de las tres patas de caños de 1 pulgada, luego corté otros tres trozos iguales del caño de 1 pulgada, les aplasté los extremos con la morsa y el martillo, y los soldé a los caños mencionados en forma de triángulo equilátero. Ahí me di cuenta de que esta manera constructiva es mejor que la que usé para la parte de arriba. I cut three pieces of 50 cm from the 7/8 pipe, crushed them one end with the hammer and visegrip (totally unnecessary), then introduced them almost completely within three 1-inch pipe legs, then cut three equal pieces of 1 inch pipe, ends flattened them with Morzan and the hammer, and welded to the pipe mentioned in the form of an equilateral triangle. Here I realized that this constructive way is better than what I used for the top part. Tuve que forzar un poco los caños de ambas partes para que la parte inferior entrara y se deslizara con cierta facilidad en la parte superior. I had to force some pipes on both parts to enter the bottom part and quite easily slip into the top. Dado que el mueblecito debe servir también como escalera, debe constar de un escalón que permita subirse cuando está extendida a la altura máxima. Corté otro trozo de caño de 1 pulgada, le aplasté los extremos y lo soldé cerca del extremo inferior de las patas de la parte de arriba. Since the little furniture should also serve as a ladder, it must have a step that allows to climb when it is extended to maximum height. I cut another piece of 1 inch pipe, crushed it and soldered the ends near the bottom of the legs of the top part. Hice algunos agujeros arbitrariamente espaciados, dado que no necesito cumplir con ninguna medida en particular. Si llegara el caso de necesitar una altura determinada, no me costará nada hacer nuevos agujeros, dado que los caños son suficientemente fuertes como para soportarlos. Usé tres tornillos para chapa, uno para cada pata. La rosca evita que resbalen y se salgan. I made some arbitrarily spaced holes, since I do not need to comply with any particular measure. If I were should need a certain height, will not cost me anything to make new holes, since the pipes are sufficiently strong enough to support them. Use three sheet metal screws, one for each leg. The thread keeps slipping and out them. Les di una emprolijada a las soldaduras con la amoladora, y le di al conjunto una mano de pintura blanca. Corté algunas maderas de machimbre de pino y con ellas hice la tapa superior. Les di varias manos de laca al agua, que las protegerá de la intemperie al mismo tiempo que actúa como excelente adhesivo entre una tabla y otra. La tapa va asegurada a los caños mediante 6 tornillos para chapa. I leveled welds with a grinder, and gave the whole a coat of white paint. pipes with 6 screws for sheet metal.. Ya la he usado algunas veces, y se siente muy sólida, lo cual es lo más importante. I've already used it a few times, and feels very solid, which is the most important. I think your project makes good use of affordable, strong materials. It definitely meets and exceeds your needs for years to come. Well done. Thanks for your kind words, sabr686. I can't get by without a little step stool. Sometimes we can all use a little boost, or sit. I have to say yours looks like it fell out of space to me. I like it though! Thanks for your comment, Fred. Your stools are very nice and look solid. My design is not inspired by the aesthetics, at all. What I wanted was to do something simple, cheap and practical, and it turned out! 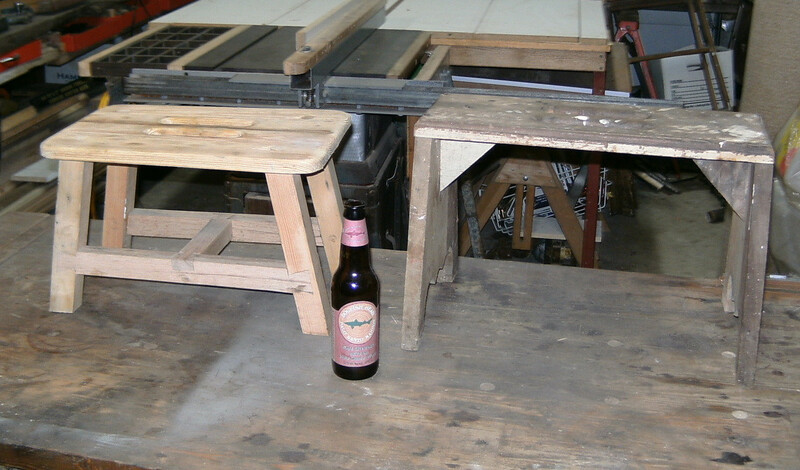 Yesterday I started doing the electrical wiring of the workshop, and this table-stool-ladder was really necessary. I have also a foldable aluminum ladder, but it is often better to use my design. Due to it is a tripod, is always stable. Besides, I can be stand hours over their flat top cover, without pain in my feet like in the steps of the ladder. I used really big nails to hold it together. The shanks are 3/8s of an inch thick (9.53mm) The wood is from a tree I cut down in my back yard. We grow very strong oak here. Cutting the dados the legs set in was a little tricky. It actually held together without any nails, but I pinned it just so it would never fall apart. Never for it might be 1,000 years? It is going to be sturdy for the life of anyone reading this post today. That I can guarantee. The dreaded case of ladder foot. If you are getting ladder foot that means the shoes you are wearing have soles too thin. I have a heavy pair of boots I can stand on a ladder all day in and it does not bother me. Wow, that stool seems very strong. Did you cut the timbers from the tree? I know that the sawmills don't want sawing trees that are not grown on purpose, because domestic trees usually have nails or wires inserted into the wood, and that ruins the saw. With respect to the duration of my table-bench-ladder, I conform it lasts the next 55 years I have planned to live. Ladder foot: yes, since here is midsummer, and very hot some days, I am using lightweight slippers. Each time I climb to the ladder I think it will be only 1 or 2 minutes, but along the day are hours. Sometimes I thought to make a pair of wood soles with velcro to attach to my shoes, but I have not had time to make them. I knew you were wearing slippers! 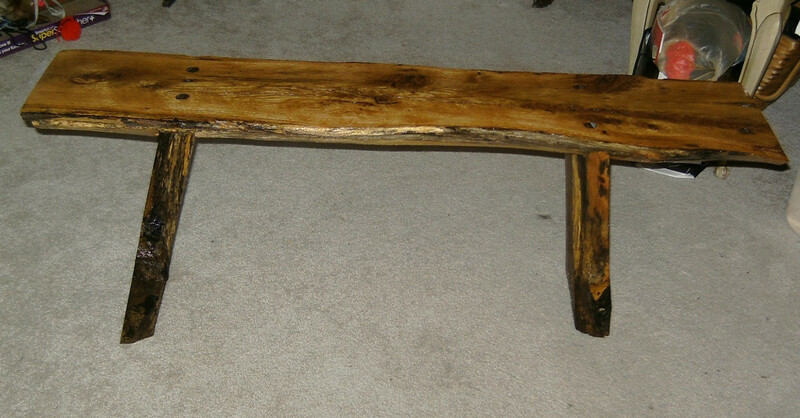 I did cut the tree down I made that bench out of. It was in the way of my shed expansion project. It is so cold here now I have suspended activities in my workshop for the season. That column is square to within .003 of an inch (0.06mm) If the rest of what I'm making comes out like that then it is really going to come out good. It is awesome for me that problem of the cold and humid air rusting your tool. Here in Buenos Aires (I am 42 Km toward south east) temperatures are never extreme, maybe -2 ºC in winter, 38ºC in summer (today 36º). Then, I hope will not have that problem. I have thought to bring an extension of natural gas to my little shop, because it is very unpleasant to work with cold. Today I ended up with the electrical part, at least chiefly, perhaps will add some extra socket or lamp later, but for now I will end it. Regarding your secret project, what a precision! May be we will have an instructable, OK? Warm air holds more water than cold air does. So if I warm my shop up the air will get humid, then when it cools the moisture condenses out of the air onto my cold metal tools. I live close to a lot of salt water here so there is salt in the air. Makes things rust really bad! To be honest it was less precision than dumb luck. If I had been trying to make the box square I might have gotten it to about .01 of an inch (0.26mm). I made my tool holder some random size, then just boxed it in. When I measured the outside of the box it just happened to be that close to square. My project is secret because it has little chance of working right. It is more of a test. A first try at something. Now I have my doubts. So I must see it through in order to see for myself. If it does work I'll take some pictures and put them up here. No step by step though. I wish you luck with your secret project. I walked trying to make a super external combustion engine, based on pop-pop motor, but no luck. Then I found on the web that I was not the only, a lot of guys had the same idea and none was able to run the engine. Yet totally don't rejected the idea, maybe try again this year. I like seeing how you fit the joints together for welding. This is a nice project. Thanks, Phil. Really, to weld these thin iron tubes is not easy. Good idea. I always need to get out a small ladder to reach my shelves (after a few scares climbing on unsuitable objects). This stool would serve many workshop functions. Thanks, caarntedd . It is very useful for me. You can make it in wood, too. Thanks, I8nite. It is very useful for me.